Kevin Patton: In their book, Understanding How We Learn: A Visual Guide, learning scientists Yana Weinstein and Megan Sumeracki state: Educational practice does not for the most part rely on research findings. Instead, there’s a preference for relying on our intuitions about what’s best for learning. But relying on intuition may be a bad idea for teachers and learners alike. Kevin Patton: In this episode I discuss a new discovery about the shape of red blood cells, and I chat with the authors of a new book about how we learn. Kevin Patton: We all talk about red blood cells in our anatomy and physiology courses, right? And we also talk about the fact that they have this distinctive shape, a biconcave disc, and that that shape is deformable. It has to be, right, because there are all these varying conditions throughout the circulatory system. They have to be able to squeeze through various sizes and shapes of capillaries and have to be able to withstand varying pressures in different parts of the circulatory pathway. Kevin Patton: Well, how active and how passive is that control of that shape, that deformability in red blood cells? Well, a few months ago there was some research that was published in the Proceedings of the National Academy of Sciences where some researchers at Scripps Institute did some investigation and found that the cytoskeleton is very involved, which of course we knew that. I mean, just in general principle we know the cytoskeleton is involved with the shape of cells in general. We also know that there’s a portion of the cytoskeleton that is associated with the membrane that’s on the inside of the plasma membrane and it can have an influence on the shape of the plasma membrane, therefore the shape of the cell. Kevin Patton: What these researchers found was that there is a network of actin filaments that are found within that membrane as part of the cytoskeleton, and they also discovered that there are myosin molecules that are there that associate with those actin molecules. We know that myosin is a molecular motor. I mean, we know all about the actin myosin reaction because we have talked about that already in our courses when we talk about muscles and muscle physiology and how contractions occur. So that same kind of interaction can happen here and it can control the rigidity of the plasma membrane of the red blood cell. Kevin Patton: Now why is this important? Well, number one, I mean it gives us more information about the cytoskeleton, gives us more information about how red blood cells work, and in the A&P course that kind of information can be helpful to underscore to students that there are underlying mechanisms in the body that are used in different ways in different parts of the body, that actin and myosin aren’t only acting in muscles, they’re acting in other places. So it’s a good opportunity to apply things in a different way and kind of push through to a higher level of thinking and see connections, conceptual connections. Kevin Patton: But beyond that it’s also interesting to throw out the fact that the shape of red blood cells is at least partly controlled by an active mechanism. This isn’t some passive inner tube floating along the river or whatever. There’s some active mechanisms inside the cell that are regulating that. Kevin Patton: Of course, in terms of practical applications of the research, eventually we might be able to figure out some ways to control that mechanism, and therefore control cell shape. So maybe we’re a little bit closer to finding some other strategies that we can help regulate things like, oh, sickle cells in sickle cell anemia or other kinds of issues that relate to red blood cell shape. There’s some links in the show notes and on the episode page if you want to learn more about this. Kevin Patton: I recently read a new book about teaching and learning that is so spot on for what we’re trying to do here at The A&P Professor, that is to find the best ways to teach our students, but I just had to share it with you. It’s called Understanding How We Learn: A Visual Guide. I’m happy to report that the authors have agreed to spend a few minutes chatting with me about the book. Kevin Patton: Dr. Yana Weinstein is assistant professor of psychology at the University of Massachusetts, Lowell. Yana, welcome to the podcast. Yana Weinstein: Thank you. So excited to be here. Kevin Patton: And Dr. Megan Sumeracki is assistant professor of psychology at Rhode Island College. Thanks for coming on the podcast Megan. Megan Sumeracki: Yeah, thank you so much. Kevin Patton: Yana and Megan are co-founders of The Learning Scientists, a project whose goal is to make scientific research on learning more accessible to students, teachers, and other educators. There’s a native of St. Louis in myself. It’s nice to be chatting with two adopted St. Louisans, both having studied psychology at Washington University in St. Louis. Well, let’s get started. Kevin Patton: I know why both of you wrote this book because when I read it, I saw that you explain your purpose very clearly at the beginning. But that purpose is important to understand why any of us A&P professors would want to read it. Can you briefly summarize your goals with this book? Yana Weinstein: Yeah. It’s funny that you’re saying it to the beginning of the book because maybe I should go take a look at the book and see what we said so that I don’t contradict what was our intended purpose, ha, ha. But the way that I see it now in retrospect is that what we wanted to do was get the information on how students learn from the perspective of cognitive psychology out there into the hands of the students themselves but also teachers and parents who might be raising children who are trying to learn, so that they can utilize that information to make informed decisions about either how to study or how to teach or how to help their children with homework, or all of the above. Somebody reading the book could easily be a teacher, a student, and a parent at the same time. Those are definitely not distinct categories, but the idea was to provide the information in a manner that is concrete. 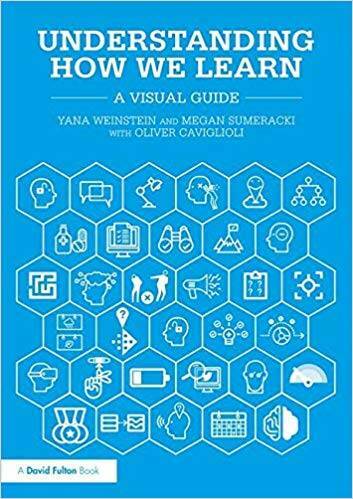 Yana Weinstein: So that’s what we use the visual tour designed by the very talented Oliver Caviglioli, who is the illustrator of the book. We worked very closely with him to generate, well, for him to generate illustrations that weren’t just decorative but actually depicted what we were describing in words so that then people reading it could make use of what we call the dual coding principle which is described in the book, the idea that when you combine words and pictures, you’re going to be able to learn the information perhaps more effectively. The book is filled with those pictures as I’m sure you’ve seen. Maybe on the show notes you could post an example of one of the chapter previews that shows quite how many different pictures there are in there to depict what we’re writing in words. Yana Weinstein: To summarize that I guess in one sentence that’s not as long, the goal of the book was to get information about the science of learning into the hands of teachers, students, and parents. Megan Sumeracki: Yeah, and one of the things that Yana and I are really passionate about is engaging in bidirectional communication with people who are teaching and people who are learning. In addition to being researchers, we are also instructors and we’re always learning and some of us are parents. The book is in some ways one directional because we wrote the book and then others can get the book and can read the book. But we also really like to engage in conversation and we do that over our blog and at other resources on learningscientists.org which is sort of a hub where we keep a lot of materials and also our Twitter account @AceThatTest. Kevin Patton: What’s an example of evidence space teaching or learning strategy that you discuss in your book that some anatomy and physiology teachers may not be very familiar with but should be? Yana Weinstein: That’s a very good question and it’s almost hard for me to answer because I don’t know how familiar the teachers would be with these concepts. On the whole when we talk about the six strategies in particular that we talk about, and some of them appear to be more widespread than others, so my guess would be something like dual coding which is combining pictures and words. It’s something that is probably utilized a lot by anatomy and physiology teachers because there’s a lot of diagrams just naturally in the textbook. Correct me if I’m wrong, I don’t know. What do you think? Is there a lot of use of that principle, combing pictures and words? Kevin Patton: I think there is because especially the anatomy part but even physiology with all the flow charts and diagrams and so on. I think most of us do use pictures a lot along with the words, so I agree with your perspective on that. But I doubt whether many of my colleagues because this was a new term to me, so maybe it’s just me, but dual coding isn’t something that would’ve popped into my head. I would say, “Yeah, I use pictures and words, yeah, I combine those,” but I wouldn’t have said dual coding. So I think thinking of it in that way, in other words understanding what I’m doing when I do that, is something that wouldn’t be widely known but the actual practice of it would probably be pretty widely done. Yana Weinstein: And you raise a good point there. We have had that feedback from a lot of teachers who say, “Oh, I already do this and now I have a framework for it.” It’s not necessarily that knowing the term changes anything, but it does enable you to then seek out more information about how to use that principle most effectively. For example, while a lot of us as teachers use pictures or diagrams, what we might not do is very intentionally teach students how to study with those diagrams and pictures. Yana Weinstein: It’s one thing to say, “Here is some information, here’s also a diagram that goes along with it.” But then how often do we actually have our students practice, that they’re putting away the written material and describing in words what’s in the diagram or putting away the diagram and then describing … and then looking at the text and drawing the diagram and then doing both from memory which would be another principle, retrievable practice. So it’s like using these tools intentionally, which is a little bit different as to saying, “Oh yeah, of course we utilize pictures as well as words.” It could be that the nuances might be something that the teachers would be particularly interested in when it comes to a technique that they already use. Yana Weinstein: That’s just one example. Megan, what do you think would be the least known among anatomy and physiology professors? Megan Sumeracki: The least known. I think in some ways the idea of spacing is maybe not quite as intentionally used. Spacing is just this idea of trying to space out learning over time. And if you take the exact same amount of time, say we’re talking about five hours, and just split that up across a week, you’re going to learn a lot more than if you crammed all of that at once. For students of course this means don’t cram right before an exam because you might be able to get through an exam but then you’re going to lose a lot of that information in the long run and you need to retain the information in order to continue building on your knowledge. You’re not learning physiology and anatomy just to pass a specific exam, but to build upon it. Megan Sumeracki: But I think we can also utilize spacing more in our actual teaching practice, and so thinking carefully about how to cover some of the basic topics that we need to cover early on and then sort of circling back to them. So I guess this interleaving as well in combination with spacing which is this idea of trying to basically jumble things up so that different concepts show up next to one another. But to intentionally put that into teaching so that we’re not going in such a serial fashion and we actually do integrate spacing intentionally in the way we’re presenting the information to the students so that it helps them learn this information in the long run. Kevin Patton: Actually I had two thoughts pop into my head as you were explaining that. One is, I mean, I think a lot of us in any discipline encourage our students not to cram because even though it might have some short-term benefit, that’s not why they’re there. They need to know this stuff for when they go into their next course and when they go into their career, and most importantly when they’re taking care of me when I’m sick, I want them to remember this stuff. We’re always telling them, “Don’t cram, don’t cram,” and now we have research based evidence that says, “Look, it’s not just me telling you this.” The research shows that massing it all together when you’re cramming just doesn’t work very well, at least not for the long haul. Kevin Patton: The other thought I had, and neither of you have had time to think about this, something that we run into in the sciences and certainly in anatomy and physiology is that we often have what we call the lecture course and then we have the lab course. I think a lot of us, and I know I used to do this. Then I figured why fight it. That’s just the way things are. We fret about the fact that I might be teaching cardiovascular anatomy and physiology in the lecture, but it might be a week and a half before they get to it in the lab part of the course, or that we have time to do that, because using a quick scheduling and all that kind of stuff you can’t always cover in the lab exactly what you’re covering in the lecture. So we fret about the fact that they don’t go hand in hand. Kevin Patton: Might there be an advantage to that in the framework of interleaving, that we’re doing cardiovascular in lecture, then we move on to let’s say pulmonary physiology, and then in lab now we’re back to cardiovascular again. Am I thinking straight on that or is that not an example of interleaving? Yana Weinstein: Yes. That’s illustrating the principle of spacing. It’s tricky to … Interleaving and spacing get tangled up a little bit because interleaving, I mean, as used in the scientific literature, then once terms are used by people outside of the literature is they’re sometimes used differently. But the way that we use them in the cognitive literature is interleaving would be literally within one session. If you’re for example studying for some kind of quiz and you’re doing practice problem, interleaving would be doing different types of problems one after the other, but the same type of problems would be over-learning and practicing. Yana Weinstein: Whereas space practice I think what you’re referring to and I do agree that it is a potential advantage that you’re spacing out the exposure the students get to the specific materials once in the lecture and then later on the lab, but cramming essentially the lecture in lab until one time period which means that then they would get a lot of information at that point and then there would be a long gap between that and then the next time they actually would need to use it or revisit it and they would be likely to forget quite a bit of it, like maybe too much of it at that point for it so that they would have to start not quite from scratch but the extra boost that they would get because they’re presumably then going to need to review that material for a later exam, right? Yana Weinstein: Ultimately. Yeah. So at that point without the spacing out they may have forgotten quite a bit. Megan Sumeracki: I will say too that I think, yeah, what you described is spacing and that’s great. I think it also produces an opportunity for interleaving. If you teach topic A in lecture and then you end up teaching topic B in lecture, and then during lab that week you go back to topic A, that provides an opportunity in the lab to sort of mention both topics in the same class and maybe compare how they’re similar or how they’re different. So even though the lab is about topic A, whatever you’re learning about in lecture in topic B might be able to interleave in, and that would sort of give one of the benefits of interleaving, is that it allows you to see how things are similar and how things are different, and helps you to discriminate. Megan Sumeracki: Then of course you could add elaborative interrogation in there where you’re asking students explicitly to talk about the similarities across labs and differences across labs. I think one of the big takeaways is that it’s really hard to talk about each of these strategies in isolation when you’re really trying to design an entire course. You can certainly learn each strategy individually. When I teach my students, I often tell them to start with retrieval and spacing first and get those down because they’re most I think the easiest to implement in some ways and they’re the most broadly applicable. Megan Sumeracki: But then, once you really start getting into all of these strategies, combining them is one of the best ways to go about things and it then becomes difficult to say, “Well, I’m using x strategy here, I’m using a different strategy there.” They sort of start to blend together and that’s a good thing. Kevin Patton: Sure, yeah. Well, that makes a lot of sense. I did have some early formal training in teaching strategies. I prepared for secondary science education and then I later got into college teaching, and I’ve been doing that for over three decades. My beliefs about how learning works and how teaching is done it has become pretty baked in. But as a scientist I know that I have to find a way to be willing to let those beliefs be challenged by the results of research, carefully executed research. How do either or both of you think we can best help each other break away from those classical approaches or strongly held beliefs that are about things that are not very effective, and maybe instead explore more evidence based methods that do work well, that have been demonstrated to work well for learning? Megan Sumeracki: I actually, I thought about this a lot. I think one of the reasons why for many of us these things can kind of be baked in is that we have so many years of experience, all of us, learning, because we’re in school for so long as children and so by the time we get to university and we are starting … If you’re going to become a teacher, you’re starting to study how to teach, you just have a whole lot of experience in that area. So a lot of times we’re drawing on our own experiences and our own beliefs about learning, just based on what happened in school. Megan Sumeracki: One of the things that I think is really important for us to start to talk about more and to recognize is the fact that our own assessment of how well we think we’re learning in many situations is not always accurate. Unfortunately it’s very common to see in studies about effective learning strategies that students will report, so you’re pinning two strategies against one another to see which one is more effective, like repeatedly reading something versus reading and then putting that information away and trying to retrieve it from memory, so retrieval practice which is something that we recommend students do all the time based on science. Megan Sumeracki: When you’re repeatedly reading, it feels really good, and it feels familiar, it starts to feel fluent, and that makes you think you’re learning it really well and that kind of help with comprehension. Of course, you need to read and understand what’s going on in order to be able to produce it. But the problem is that in life the exam is not read your book as quickly out loud as possible, so that familiarity and fluency isn’t going to be as helpful. In life you’re taking exams or having to recall the information when you’re seeing patients or when you’re taking larger board exam. So the fact that that familiarity or fluency is driving up our belief about how well we’re learning is problematic. Megan Sumeracki: At the same time, when you have to put the material away and practice retrieval, we often will feel like we’re learning less, we feel less confident, and we’ll report lower levels of learning. So if actually you’re to stop the experiment there, have the students, say college students some of them practice reading and some of them practice retrieval and ask them which strategy is better, you’d walk away with an answer that’s not correct. The students will say repeated reading is helping them learn better than repeated retrieval if they’re going by their own experiences and sort of feelings while learning. But bring them back a week later and give them a test and the opposite is true. Those students who repeatedly read were very overconfident initially. Kevin Patton: Yeah, that makes a lot of sense. I’m wondering though. I mean, I do try new things all the time. I’m always trying new things. I’ve talked to other colleagues that like to do this too, and we often get well meaning but very obvious push back from our colleagues and from our students about, “Well, that’s not the way you do things, that’s not the way it’s done. What do you think you’re doing there?” I don’t know. Have you folks run into that? Like, “No, that … We don’t want to do that because that’s not how it’s always been done in teaching.” When you’re talking to teachers and that, do you get that kind of push back or not? Yana Weinstein: Well, that’s an interesting question. I think we have a bit of a self-selected audience of teachers that we regularly talk to because we don’t go around like imposing our ideas on teachers who aren’t necessarily interested. Often we do get the teachers who say, “Oh yes, I’m doing all this all along, and now I can put labels on it,” or we have teachers who either tried it out and then loved it. We haven’t had personally, at least I don’t think I’ve had teachers say like, “We don’t want to do it this way,” but that’s because I am not telling anyone they have to do anything. Does that make sense? Yana Weinstein: I think that becomes more of a problem if you’re trying to implement some kind of change from top down. I will say in my own institution there’s certainly been push back. I tried to implement this title training as a class with students and that didn’t go down well because there was already a sense of the teaching and learning that did things their way. So there’s things like that. But on the whole I think with the work that we do we’re kind of connecting with those individuals who are particularly motivated to at least read up on it and try it so we don’t get as many of those kinds of interactions as one might expect. Would you say that’s true Megan? Megan Sumeracki: Yeah, I think when we’re brought into a school there’s definitely some people who seem more resistant than others, but whenever we’re brought into a school it’s because someone has said, “This is valuable and we want you to come in.” In that way, I mean, sometimes we get a little bit of, “Well, I don’t know how this would work.” A lot of times we’ll ask teachers to generate challenges to implementation. Say, well, what are the things that pop into mind that make you think, this sounds great but … But I can’t because of X. I can’t because of Y. We’ll often have teachers generate those and we’ll talk about them and then start to generate solutions to those problems, and a lot of times we can get around a lot of the problems, at least what we’re talking with the teachers, and figure out ways to give it a try. Megan Sumeracki: At least with my students, I find that when I’m making a small change and I explain to them why we’re making the change, and I mention that it’s because of this principle, it’s because of research, that can help sort of get the students on board, and so it might help get other instructors on board too, just to know this is coming from this place and here is why I’m trying it, and if it’s not a huge massive overhaul, then I do think they tend to be sort of a little bit more welcomed. Kevin Patton: Something that really I appreciated in the book, well, I appreciate the whole book, but at the end the last few chapters are basically giving examples to students and to teachers and to parents what are some small things that I can do and what are some next steps, because when I read a book like this, I just want to go out and, “Okay, I’m going to do all of this. Next semester I’m going to do all of it.” And then I realize, “Oh my gosh, I can’t.” I first have to understand it better and then the next thing is how am I going to implement it. Your explanation I think is a good one and that is just two little bits. As that succeeds or you tweak it to make it work, then on to the next one. Kevin Patton: Dr. Megan Sumeracki and Dr. Yana Weinstein, I really appreciate you taking the time to chat with me today. Kevin Patton: You can find The Learning Scientists at learningscientists.org. There you can explore their blog, their podcast, videos on learning strategies you can share with your students, and all kinds of useful downloadable resources. I’ll have a link to that and of course to the book Understanding How We Learn: A Visual Guide in the show notes and at the episode page at theAPprofessor.org.